"Britain will never join the Euro".... Germany has effectively won the Eurozone war as one after another EU states bowed to German pressure to toe the ECB / Bundesbank line for greater monetary union and centralised fiscal management under the guise of saving the euro or effectively face monetary death through either ever higher market interest rates such as that suffered by bankrupt Greece's 2 year bonds trading at a yield of 33%, or ejection from the Euro-zone and resulting economic collapse and an hyperinflationary wipeout of all savings. This left Britain to Veto the treaty changes that 26 out of 27 agreed to and thus performing a tactical retreat Dunkirk style as David Cameron failed in his attempts to protect the city of London against primarily from French and German onslaught that has long enviously sought to steal a greater share of London's prominence as the defacto centre of the European financial system through which approx 50% of all financial business is conducted. Unable to compete in the market place the French and Germans have long sought to cripple Britains' ability to compete against the Euro-zone currency block by means of destroying the UK financial sector through a series policies including a transaction taxes that would overtime diminish the advantages of doing business in London that is outside of the euro-zone and this transfer business towards the economic centre of Germany and to a lesser degree France, which the twin headed hydra of Merkozy knew would eventually force Britain to join the Eurozone in response to the increasing leakage of financial business to the euro-zone. 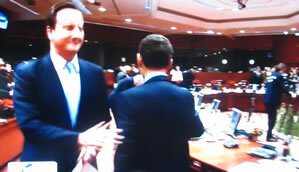 David Cameron unfortunately miscalculated the degree to which Merkozy had deployed arm twisting tactics not only on on the hook euro-zone members but also the other 9 EU countries outside the Eurozone such as Poland that David Cameron had hoped would add to the UK's weight in negotiating opt outs for the UK's financial sector. Unfortunately none of these countries could recall when Britain had come to their aid in their hour of need and instead fell under the financial spell of the Merkozy under the promise of eventual ECB funding of their budget deficits, which left Britain and David Cameron totally isolated as the only country to vote against the proposed EU treaty changes, instead now the Euro-zone will go it alone with the effective Germanification of the Euro-zone. What's Planned for the EU 26? Provide Euro 200 Billion for IMF to Loan to Euro-zone members to re-finance debt during Q1 2012. Britain's veto has effectively delayed implementation of the amended Treaty for several months as lawyers try to construct a legal framework for the treaty that excludes Britain, however it effectively means that Germany by probably March 2012 will take economic control of all euro-zone members, with the possibility that the other 9 none eurozone countries will also join and thus totally excluding Britain from all decision making meetings. Has the Debt Crisis Been Solved? In terms of the euro-zone sovereign debt crisis, no solution has been agreed to or even indicated that addresses the key problems of economic stagnation and growing unserviceable debt mountains, all that has happened is that the can has been kicked at most a couple of months forward into early 2012 when countries such as Italy, Spain and France will have to collectively re-finance over a Euro 100 billion of maturing debt that WILL to some extent have to be monetized by the ECB because the market won't buy it at anywhere near sustainable interest rates. In this respect we have already seen the ECB (Thursday) start the ball rolling by offering unlimited amounts of cheap money to Euro-zone banks for upto 3 years in an attempt at alleviating the credit crunch that risks a collapse of the euro-zone banking system, which effectively amounts to monetization of euro-zone debt through the backdoor, i.e. swapping PIIGS debt ( as collateral) against funds borrowed from the ECB, so if the banks default then the ECB is stuck with PIIGS debt, so the ECB is effectively buying PIIGS debts in all but name. When the deal is finally done (it could still unravel), it will mean that Germany will boom (France hopes to somehow also benefit ) as they prosper from a captured export market, where Germany finances and massages the spending of other european states for their goods and services to a far greater extent to which we have witnessed the likes of China lending money to the United States to buy Chinese junk in exchange for greater Chinese economic power and diminishing US economic power. The euro-zone members under debt crisis pressures are signing themselves up to becoming economic slave states of a Greater Germany. On the way out of the Summit, the Irish Prime Minister consoled a latently depressed and isolated Cameron that "you are still a member of the single market". Unfortunately Britain is the clear loser here because there is no way that Britain can go against the whole E.U., which appears united against Britain therefore expect the E.U. member states to vote for a string of laws that will hurt Britain's biggest industry the financial sector, such as preventing euro-zone banks from doing business in London, which means Britain could now be on the fast track towards an exit from the European Union. If Britain is on the way out then it needs to act fast to get the upper hand against a weak euro-zone, because at this point in time Britain has the advantage in that it can ACT quickly without having to have summits with 17 other member countries, especially as all the summit has done is to press the pause button on the crisis for perhaps no more than 2 months during which time the debt crisis continues to get BIGGER! Britain needs to put itself ahead of the curve by sparking a domestic boom, even if it means devaluing the currency by as much as 20%, because as we have seen this week, Europe will NOT be there for Britain, the time to act is now! If Britain waits then it will be too late because as my earlier analysis illustrated (28 Nov 2011 - Eurozone Being Swallowed by Expanding Debt Black Holes, Mega Bond Market Profits and Default Booms ) that Britain has its own ticking debt time bomb that could send interest rates soaring to double or even triple current yields on 10 year bonds, by which time it will be too late and Britain will be forced by the IMF to swallow austerity on the scale being shoveled down PIIGS citizen throats. The euro summit gives me more time to get rid of cash for hard assets such as properties or low risk paper assets such as corporate bonds (as I am fully stocked up with likes of dividend stocks courtesy of the summer-autumn correction), as the outcome remains in that fiat currency is going lose value because the politicians only have one solution in mind which is to print money to buy votes, and therefore feed the inflation mega-trend (euro likely to fall at a faster pace than sterling because the markets aren't stupid), though now the risk of loss of nominal funds on deposit in the banks has been reduced to at least Mid January 2012 (hopefully), when we will again start to see building market pressure towards the flood of sovereign debt refinancing which is likely to result in higher sovereign debt yields and therefore the banking system again starting to freeze towards credit crisis extremes. So if you have not already done so, you still need to protect your cash against the worst case scenario (step by step guide here How to Protect Your Bank Deposits, Savings From Euro-zone Collapse Financial Armageddon). Off course you should be eyeing moving your funds out of the banks because after tax your destined to lose a good 3% per year of your deposited funds value anyway. In this respect you do have to take on a little risk, but given that the funds on deposit at the banks are at risk anyway you can protect against the inflation mega-trend for instance by buying corporate bonds, for example Tesco's very recent offering of 2019 RPI Index linked Corporate Bonds that Pays RPI +1% (also indexed), which if held to maturity protects you against inflation with very little risk, also if purchased in an ISA the interest is tax free, and being a corporate bond is traded on the secondary market (can be bought and sold at any time via your stock broker). Really, sincerely, the banks are treating us all like suckers if we keep ones money on deposit in any UK bank that pays less than inflation (even before tax), that means 99% of all currently available UK deposit accounts, so do your research and up your tax free returns to between 5%-7% by taking a look at corporate bonds, especially as these days many corporations have better credit ratings than many sovereigns. Though as with dividend stocks, don't put all of your eggs into one basket, spread your exposure amongst a number of issues and maturities and take the corporations credit ratings into account. Despite the crisis news and widespread calls for an always imminent bear market to start, the stock market continues to trend towards a new bull market high by year end (DJIA). The bottom line remains that whilst the debt crisis can's continue to be kicked down the road then the bull market will do what bull markets do which is RISE! 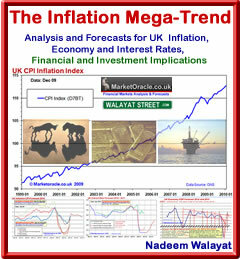 So continue to enjoy the santa rally, I will endeavour to complete an in depth analysis by year end or early January 2012, which is pending analysis of the Inflation Mega-trend, UK economy, and the UK housing market, ensure you are subscribed to my always free newsletter to get this analysis in your email in box. Your wealth protecting against bankrupting money printing sovereigns analyst. You have a downer on "cash" in the UK because sterling is going down via printing. Your answer is to buy something like a house instead. Can you not see the elephant? A house in the UK is denominted in sterling. If you have a downer on sterling why not move your cash into something else, wait for sterling to devalue, then swap it back and buy your then cheaper assets? We have already had a 25% devaluation, it has not created jobs or solved our debt crisis. You have been very critical of the B of E in the past and now you think their strategy is brilliant? I get the impression that you are buying or have bought a house and all your analysis is now directed to justifying that move. I have a downer on cash because the banks are bankrupt and there is an inflation mega-trend in play that requires at least 6% per annum just to keep value. Nothing to do with sterlings exchange rate, because all shifting cash abroad would do is to INCREASE the risk as now you have an exchange rate risk involced, which would be fine for risk assets but not for ZERO risk assets. Your missing the whole point, I AM critical of the BoE, what I am saying is that they have NO CHOICE BUT THE PRINT MONEY, not that it is a good thing but is inevitable, the BOE actions are averting a market panic, whereas the bankrupt fools in europe by not printing money are risking the euro blowing up and igniting worsening market panics, of which we have already seen take place right across the euro-zone bond and stock markets such as Italys bond and stock market panics. Instead a MORE bankrupt UK has 10 year bonds trading at less than 1/3rd Italy's yields. The only way to prevent a run on the government bonds is to print money and buy them, else the banking system WILL GO UP IN SMOKE ! This is why money printing needs to occur sooner rather than later because QE inflation is a relatively small price to pay compared to a collapse of the financial system. We have had a taste of how banking system collapse could take place with the collapse of MF Global as a consquence of losses on its holdings of ITALIAN DEBT. So YES Money printing is BAD, but financial collapse is worse as there are many other MF Globals outthere ready to go up in smoke that risks a chain reaction collapse of the financial system, so yes central banks should print money and buy bonds to drive yields lower as once the banking system starts to collapse it will be over within a few hours and too late to do anything, then all the cash on deposit in the banks will be gone! so I am correct to transfer out of cash because there is a real and present risk of a collapse of the global financial system and I don't see how I could emphasis this any more. With regards justification of actions, I would be infinetely better off if there were deflation in stead of inflation so if what you say were true then I would NOT have been warning of an INFLATION MEGA-TREND for the past 2 years. The whole point of analysis is to determine what is the most probable outcome and then act before the event. MY housing market analysis is NOT complete and WILL be indepth, run to at least 30 pages, and WILL aim to give a PROBABLE forecast for the next 2-8 years. At the end of the day, I have questions that I need to know the answer to, then I can act either liquidate or establish positions or hedge and that is the primary purpose for my analysis, not to justify past actions but to re-evaluate on what I should do next. I think you comments are wanting to support your hopes for lower prices because you are waiting to buy ? Give me a few weeks and I will give you an accurate unbiased forecast / opinion that 'may' support your housing market hopes, for I won't arrive at a forecast conclusion until AFTER I have done all of the analysis. I think it better to buy buildings or land if they are cheap - I am not sure if average prices in the UK have hit bottom - I doubt it. However, there are properties in the UK and around the world where the owners are obviously selling very cheaply to get hold of cash or banks are getting rid of repossessions (UK), foreclosures (US). Why buy at average prices? Go bargain hunting instead. You cannot print wealth. Money printing now is not a solution it is merely a delaying tactic. If the financial system collapsed wouldn't house prices as well? The banks would have to be nationalised and hopefully sensible lending would return. It may lead to money printing to cover the £85k deposits but isn't that better than money printing before a collapse for those with cash? If we had a deflationary collapse I would lose on the gold/silver and shares initially but I don't have to sell them. It's true my positon is that I want house prices to fall. However this is not just because I do not own property. I think that the higher house prices are, then the more money banks make from the public, as they are lenders. House prices are all about lending. Just do the maths, from 3 times main income plus 1 times second, to our now 4 times joint income. I don't see debt as wealth I see it as a prison. I may never buy a property in the UK, in fact I spend some of my time trying to persuade my children to leave. I don't think that living in a country that encourages debt but discourages work and saving is the place to be. I fear that looking to the future an overcrowded UK is not going to be a very nice or safe place to live. Why do you stay in the UK? Is it for family reasons? Yes Britian with a debt burden of est 500% (real probably higher) cannot grow its way out but it can INFLATE its way out whcih is what it is doing to the tune of £550 billion per year (5% of £11 trillion). My portfolio is pretty much similar to yours, but cash is always losing money at approx 3-5% per annum, so that £85k protection per banking group is small comfort, so cash is not something that should be held for the long-run unless one can fix at rates north of 6%, which is possible when the timing is right i.e. during most of 2008. So until I see sterling rates of 6% with near zero risk then I want to be out of cash. Currently the only thing that beats inflation are a few corporate bonds such as the Tesco RPI bond mentioned in the article. Ive considered emigrating given the dismal future this country faces, but the same holds true to varying extents for all countries due to climate change. For instance if the US comes under severe pressure, then for how long will canada be safe from US invasion ? Australia - Climate change could wreck havoc across the continent. All things considered the status quo for staying in the UK appears to be the least worst option, IF one is able to protect themselves from the Inflaton Mega-trend. The way people can survive in the UK is by avoiding the debt trap, do not borrow money and you can have a good life in the UK, borrow money and your resigning yourself to becoming a debt slave that you will regret. My gut feeling on housing is that its not going to fall (for areas where people actually desire to live in) because as you say the banks would be sitting on huge losses, and that remains the name of the game to save the banks which means the powers that be do not want house prices to fall and where the UK is concerned they CAN achieve this objective. thank you for your very interesting and helpful Market Oracle newsletter. Do you have or know of an assessment of the banks of Sweden or Iceland similar to the assessment of the UK banks that you recently published? I have most of my money in MP bank in Iceland (http://english.mp.is/) and also in Nordea in Sweden (http://www.nordea.com/) and I'm wondering how safe they are. The money in these 2 banks is basically almost my entire net worth, since we sold our house back in 2008 and have not yet bought another house, and I would not want to lose it. The smaller the bank the greater the risk as governments are more likely to let them fold in favour of rescuing the too big to fail banks. So why put your life savings in a tiny icelandic bank? Thank you for sharing your ideas on global events. I have really enjoyed your articles. You say you believe it is only a matter of time before we see higher market interest rates and previously (past articles) you mentioned you thought BofE base rates would rise. How can higher interest rates be a boon for the stock market when it would hurt millions of homeowners and the bank's bottom line? Also, if the Bank of England was to keep printing money (as you believe) what is the liklihood that we see the same bank trying to defend Sterling when the market attacks our currency and forces gilt yields up to counter much higher inflation? Something similar happened in the 1970's, did it not? If this were to happen, how can this be good for the stock market, housing market and our economy? If the market attacked our gilts, surely our stock market would suffer too as we have witnessed in other european countries recently. Lastly, is it possible for market interest rates to rise, yet BofE rates to remain the same? If most people are on tracker mortgages, this might be the one saving grace during market turmoil? What are your thoughts on this? I have the answer and will reveal all during the next few weeks, else the comments would end up being as long as the articles (before year end). It's now approaching year end and there's been no further QE from the US or EU. The entire bull market continuation is dependent on further easing, but the window just came and went with no resolution other than attempts to buy time. Do you still think we are going to see the ECB ease this week or next? I think the probability has now shifted in favor of the markets falling 10-15% from here (a retest of 10,400 DOW) as the catalyst to force EU / Germany / ECB action. All signs point that we are at the edge of the cliff yet again (Dollar, Gold, Oil, stocks, etc...) and strangely the European powers seem to have 0 sense of urgency. Barring some bazooka, I just find it hard to believe the near term trend is bullish. And waiting for a bazooka is equivalent to "wishful thinking". I'd rather miss the first 3-4% of a post bazooka bounce than be stuck with 10-15% further losses hoping that the bazooka will save the day. The markets are volatile, have you seen the Gold price crash ? If the dow was behaving like that then that would have me, well contemplating a less long position. As things stand I will re-evaluate depending on where the market stands at year end, in terms of showing strength or weakness. The market is not driven by one thing, i.e. QE, it is infinetely more complex and I am aware of a possible major driver that to 99.9% will only become apparent in hindsight (several years from now), I will post this in an article in about a weeks time as I need to get 2 articles on the economy done before hand, you will at that point have analysis that will be literally several years ahead of the curve just as the inflaiton mega-trend ebook was. 14 Dec 11, 16:59 clues? Now you have me in suspense. Any chance you could provide some short clues as to what you think is happening? It needs to be in an indepth article that explains why step by step else there will be too many questions that will delay me getting around to writing the article. But its a natural progression of the manifestation of the inflation mega-trend the clues to which are in my articles of the past year, its just in finally recognising what has been staring me in the face, which I WILL explain in-depth, hopefully within a week. I was wondering your opinion on Sterling vs AUD in the near future. If the UK prints again then the Sterling will drop further but if China slows markedly then the AUD will drop too. I ask as I hold Sterling in Australia and have been beaten by the exchange rate over the last year. You have mentioned the Tesco Inflation linked bond more than once in your articles as inflation protection. How do you think they really compare in risk to Index linked Gilts? The official ratings are AAA for Gilts and A- for Tesco? Hi the index linked gilts have been bid very high with a GRY of just 2.75% whereas Tesco Index Linked Yields 6%, a huge difference. Forget the ratings agencies, instead use commonsense, ask yourself is there a real risk Tesco will default on its bonds ? My opinion is no. I cannot say the same for ANY bank bond. The very long-term multi-year trend is for sterling to continue to fall against the AUD as a consquence of the fundemental fact that Austrilia's average annual growth rate will be significantly above that for the UK. At best all that can occur is a temporary correction during 2012 against this long-term down trend for sterling. Without spending several days if not weeks, I am unable to arrive at a probable short-term trend expectation.